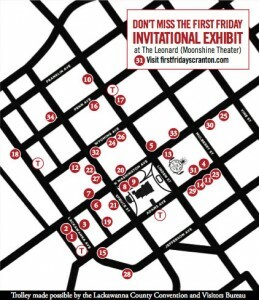 This Friday, October 3rd, First Friday Scranton has 34 unique events registered on the First Friday map! These 34 events include everything from The Invitational Art Exhibit at the newly renovated Leonard Theater to The Indigo Moon Brass Band roaming music walking around downtown and Scranton Tomorrow’s Chalk & Walk on the Square. The map can be picked up or downloaded online at FirstFridayScranton.com so you can follow along and make sure you don’t miss any of what First Friday has to offer! But what exactly is First Friday? Located in Downtown Scranton, First Friday is a non-profit, volunteer-supported organization that strives to support and promote local artists. Held the first Friday of every month, dozens flock to the many galleries and business around downtown Scranton to get in on the action. From fine cuisine at some of the city’s best restaurants and cafes to fine art in the local galleries, there is something for everyone! All events associated with First Friday take place from 6-9PM. This provides the perfect opportunity to get out and enjoy the weather while seeing what the city has to offer. And although all events are in walk-able distance a trolley bus is available to provide shuttle service to designated stops. So whether you are a foodie, an art lover, or an avid shopper First Friday is the place to be.